Hey everyone, I haven't been here in a while, but I thought this would be a great CBP Project. Here's the Linc for the cars. Let's see who's up for a real challenge. 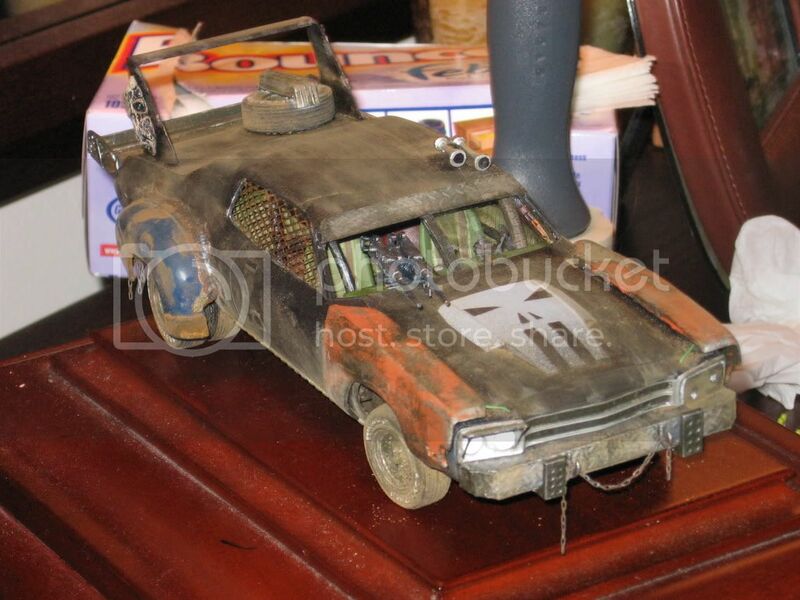 An If so of us can come up with a car or truck that is based on The New Death Race Specs this will be a realy good CBP. Hay any of you out there ever play Twisted Matel well this Movie is something like that, but it will be a lot safer all the way around if me keep it in Model form. So TOOL13 you need to come up with a list of rules or is that a rong idea. "Hay we don't need no stinking rules". "YOU CAN SHOOT ME YOU CAN BURN ME BUT YOU CAN"T Kaaaaaaaaaa "Splat" Dummy comes to mind. I agree no rules... Just let it flow... As long as its a Death Race theme, it okay by me... Let the Explosions start!!!! They were realy good just old style. If you can get more that 5 builders then this will be a realy fun build. 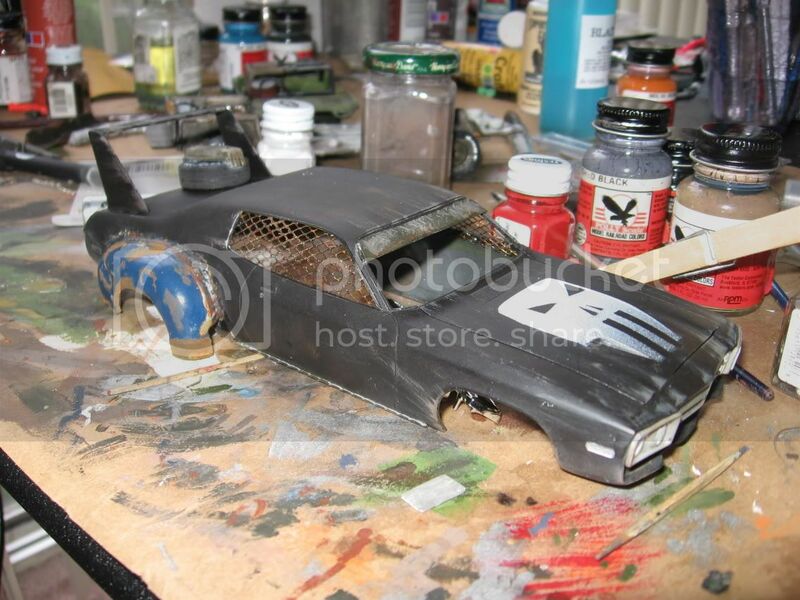 This would be an easy build for any one, all you need is an up to date car or truck and a love for scratch building, some sheet styrene would be helpful. An a love for the world gone "MAD"! I'll definitely be doing at least one of these at some point (probably Frank's Mustang), just not sure when I'll get a chance to start. What's really nice is that with the exception of the boat tail Riv, a base car for every one of the movie vehicles is available in 1/24. I'm in. I've been working on a design of my own. I posted about it in the "Other Models" section. Here's what I have so far of Project: Warbird. I just added the fenders last night. A few parts I've been waiting on just came in the mail, so I should be making more progress soon. Also, if you're looking for some quick and easy inspiration, I have ten pages of WWIII ideas in my photobucket here. Hope this CBP takes off! Gah, too late to qualify. 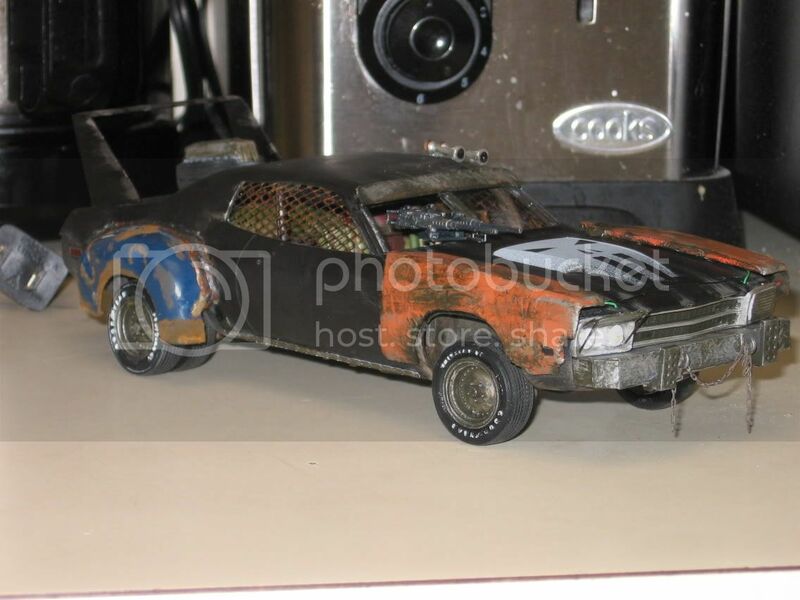 I'm finishing up a '70 Roadrunner with dualies and some other wackyness (anybody remember AMT's Cuckoo's Nest?). I'm not sure what the guidelines are, but its nearly done. Hey, I found one of my pics in somone's photobucket! You're not too late to qualify. This thing just started! Show us what you're working on. It sounds pretty cool. 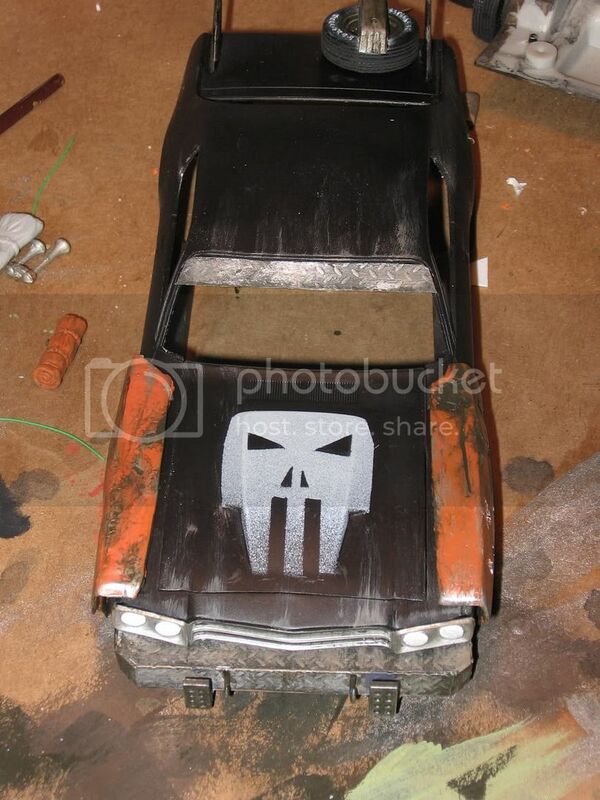 Incidentally, there's a forum at this link here where we're doing several Death Race inspired vehicles. You should check it out! Here's my window screens in place. Chuck, that site rocks man... Just Regist. Under Opiate13.... Thanks for the Linc!!! Cool! There's a lot of talented builders over there, and it's almost always got something new on it. Look forward to seeing you there! Ok I'm in but we all that will be building for this GB- Group Build must stay on track. This is about Death Race not WWIII, like armyofchuckness stunning build it truly fit's into a WWIII theme but not realy in a tuff race like the DR. armyofchuckness Don't think this is a put down it's not the only thing missing from you car to truly make it tuff for this type of race is thick armor plate or steel sheets to protect the driver, engine bay. As the car stands It look ruff and may scare a lesser car but in the DR It would be my first target, the thin skin of the body would make me want to go after it first. I hope you all see what I'm getting at. 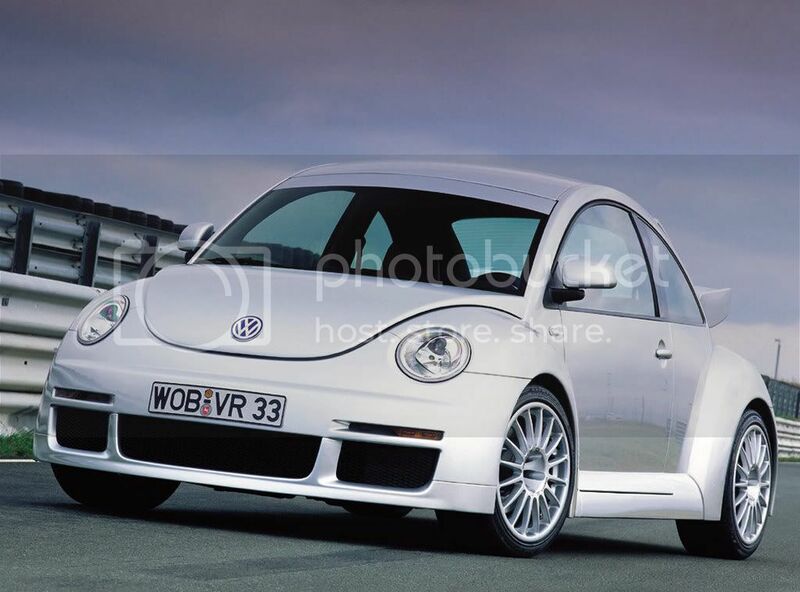 Ok a better example: A VW beetle vs Batmobile tumbler mmmmmmmmmmm me thinks the tumbler would win. As for me and what I'm thinking of doing It maybe the Truck or one of the othere cars but not the mustang. I just can't do that to a mustang. I'm thinking of one realy tuff vehicle with lots of MGs as well as Military styled armor (ERA) Oh and a set of upgraded TOW Launchers. "SEE YALL AT THE FINISH LINE"
I like what I've seen so far from armyofchuckness (very impressive)...TOOL13 is commander. No rules..just be BAD & MAD!! I've got a kit on the shelf set for this CBP. I'd like to make something like a cross of demo derby car, 4WD truck, armored vehicle and James Bond Austin Martin (with hot sauce on top)!! So.. if I'm out of line here..let me know TOOL13. I think I can put it together in a few or 4 months . If it sounds good to you guys..I'm in for this build! Fair enough. I didn't mean to intrude. Have fun! army---dude you got the lead..your stuff looks awesome! Oh and Chuck, keep it going man, don't you dare leave... The lighter you are the faster you'll go... If you have an ansonal and you've got speed... what more could you ask for right? Besides thats old muscle on old muscle on those fenders so your double plated wouldn't you think? 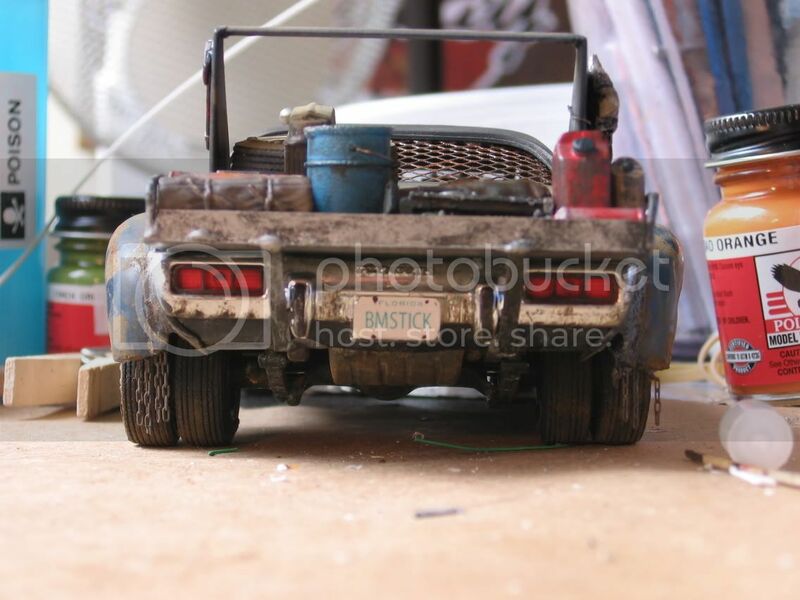 Pay no attention to the date, I forgot to set the date again after changing the battery...Those are from tonight... Heres a linc to some of my other Post Nukes... And of course my Truck from MadMaxBTT. Okay, I'll stick around if White_R34 can tolerate having such a "weak" vehicle in his midst. I was planning to add a little more armor anyway. I was able to put the body, interior and Chassis together last night. Here's what it looks like for now. I'm going to add some reinforcement to the doors and the rear is going to have a custom bumper like the one on the front. I've had a few people ask me where the bumper came from. It's just some Plastruct diamond plate I cut and glued together. 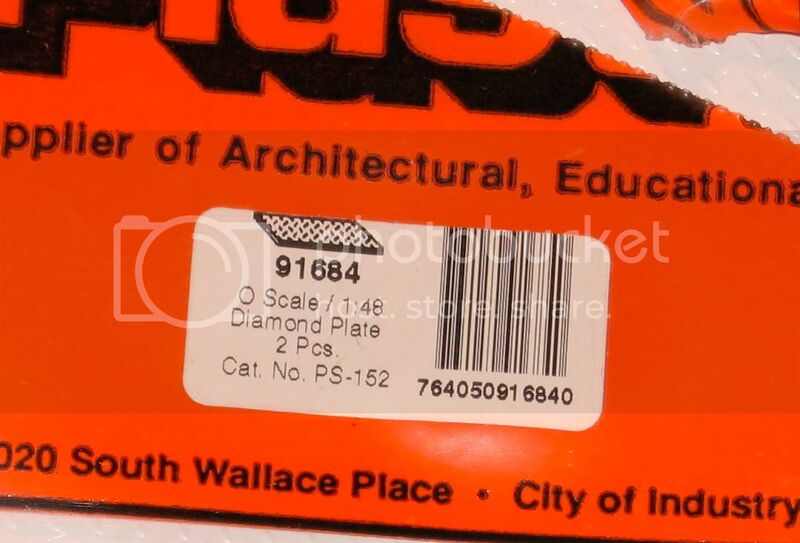 Here's the part number if you want to order some for yourself. I highly recommend it. That Tumbler looks pretty cool by the way. Also, I hope you don't mind that I boosted some of your photos of the Mad Max truck for my WWIII reference folder. That build is too cool! 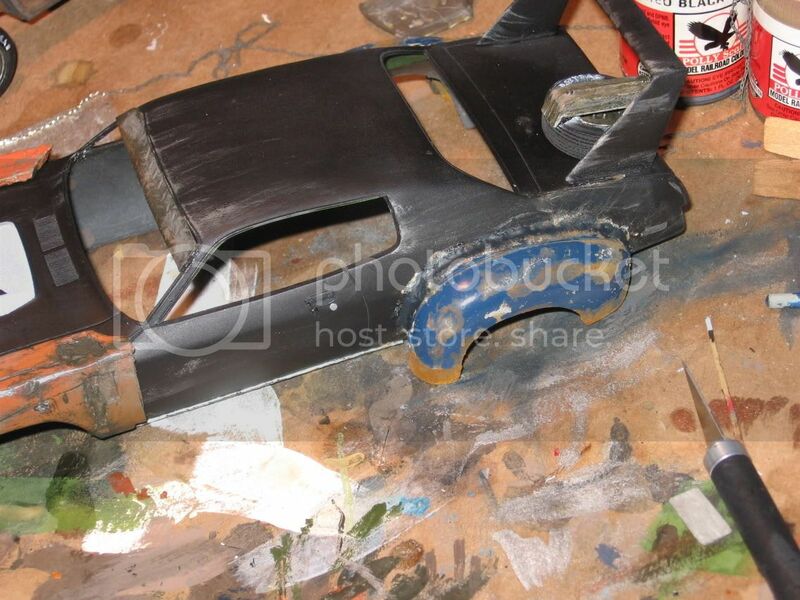 Okay guys, heres where I'm at... 1st before paint 2nd with paint and 3rd with possible arsenal!!! Hey, T13, That looks great! Where did you get the Gatling gun? I've been looking everywhere for one like that. Here's a few pics of mine with the supply deck in place. Mine is for more of a cross country Death Race like the original one from the 70s. TOOL13, looking forward to seeing what you do with the Tumbler. 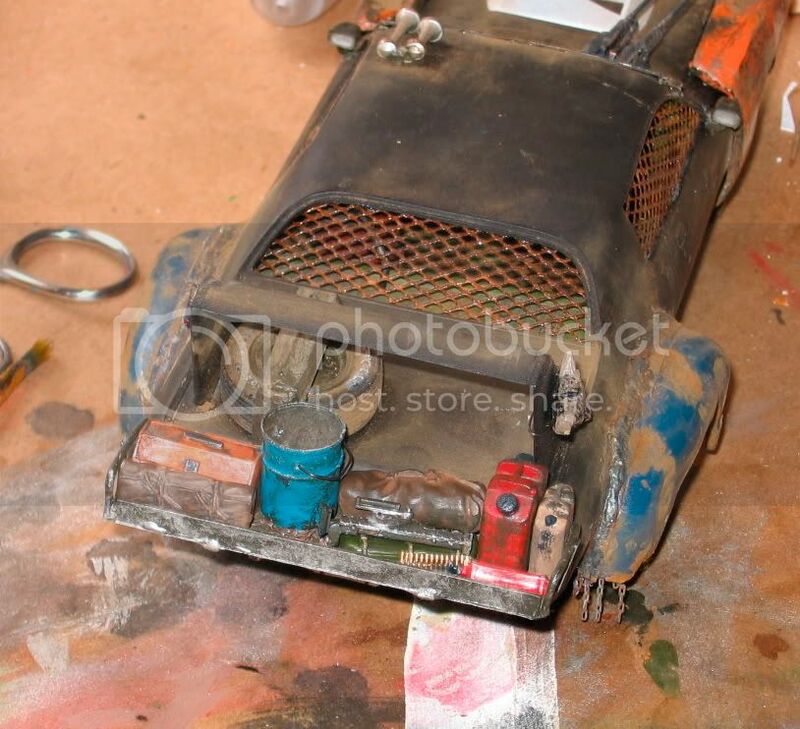 I grabbed one of those as well, since I've got a feeling it's the closest we'll see to a 1/24~1/25 Tumbler model. The Camaro is awesome. The Warbird looks great, looking forward to seeing more of it! Okay I'm in. I think some things to remember for this build-off is that this is a road race. So off road vehicles with big ol' gnarly tires are will be the first casualties. Your car must have horsepower/torque to spare as you are carrying easily an extra 500 lbs in armor, weapons and ammunition. However I plan on keeping it all under the hood, for safety reasons. And the car must be able to handle well with the extra horsepower and weight. This will be a parts box build. I plan on a 55 Ford Coupe with a stock car chassis, 426 w/crossram and.............................that's all I'm telling for now. Jantrix, who's got knarly tires? If you are talking only Horsepower, how would you explain the Semi in the new Deathrace movie. Again I understand that some cars wont make it to the end, but this is all about imagination and what we can come up with in our parts boxes, along with some diamond plate armor we may have lying around. I would like to be as acurate as possible, with aiding the horsepower with the added weight, but none of those cars exist except for the Batmobile Tumbler, that the Director and Producer made to be acurate for the movie. All they had was a beafed up Chevy 350 and that thing still went over 100 mph... Besides what road race are we talking about. The first movie was an endurance road race and the new one is on some kind of track. So building a car for either one is great. As there are not many of us that are doing this CBP. Tool, all I'm saying is a car like this one, probably wouldn't last long in a Deathrace, to many bullets flying about. A flat tire would screw up your day. The semi would be armored to protect the tires. As for the road race comment, I meant we are racing on asphalt or concrete so off road tires are not necessary. But that the car would need to be able to handle well on asphalt with the extra weight and horsepower. I know the cars don't exist but that's not a reason not to "attempt" to keep the build with the realm of possibility. Otherwise we should just do a Wacky Races CBP, and call it good. In any case a change of plans on my build. I'll be using the AMT 2005 Chrysler 300C. I think both you guys have good points! TOOL13- I think your Camero is awesome!! JANTRIX-Even though the 57 Chevy has a high center of gravity, it would be perfect for a race...heck if you can't get around them..you could go over them LOL! I think the 57 is a cool build! 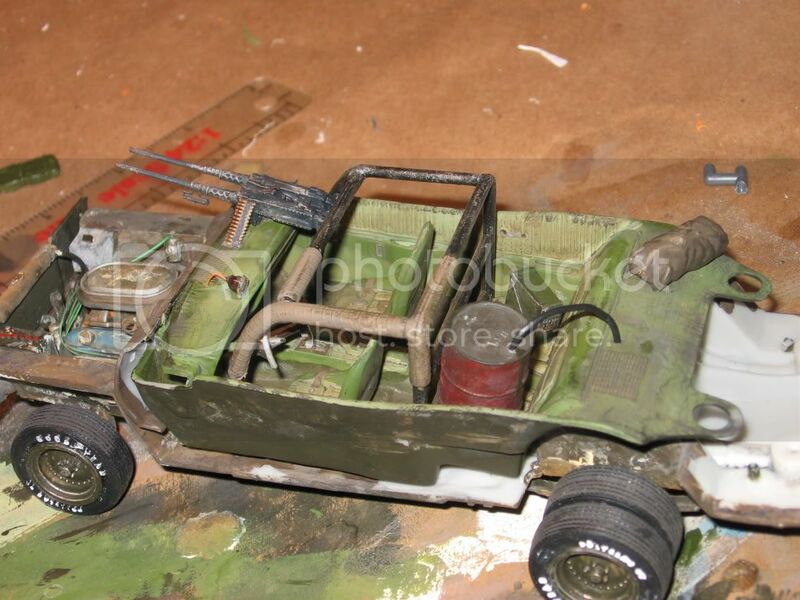 I personally am entering a highly modified International Scout 2. Heavily armed and heavily armored. With a 345 Cubic inch V8. To lower the center of gravity, I'm not using the mud/snows that came with the kit, instead I'm opting for some low profile Goodyears. Hope to have some photos soon.